Hi lovely readers! I have talked a lot about the destinations on my recent,wonderful cruise but not about the crafts! The very reason for me being on the cruise in the first place is that I was actually teaching crafts! And what a great time we had! One of the very popular crafts that we made was silk purses. We used silk ties to make these simple colourful make up pouches. I did start buying ties from charity shops but was not very happy. Silk ties in charity shops are quite expensive. They are often not too clean! They do not wash very well ( my Mother was right) I ended up buying lots of silk ties from China. These are sold as wedding ties and are colourful, good quality and nice to work with. The purses are quite simple to make and the only other requirement is a zip. If you place the tie longways and use the zip as a measure, you can wind the tie round and round until the length is used. Pin and then slip stitch as you go. Slip stitch the base and insert the zip. Job done! These are a small collection of the finished purses that were in our final Exhibition of Crafts. Didn’t we do well? As you know my friends, I occasionally work on cruise ships teaching crafts. I am always on the look out for interesting, new crafty ideas, and as such have come up with a project using silk ties. I could use polyester but silk would be much nicer. I therefore started to search charity shops and quite frankly can’t believe the price of second hand ties! Polyester are generally around £2 but silk ones are about £4.50 Why on earth are they charging so much more for silk ties? There are dozens of them in the shops and are obviously not selling. I don’t want to pay too much as I need at least 30! That took me to eBay where the plot thickens. I found great silk ties at a cheap rate (£1) so I decided to order three as samples to see if they will work. OK they are coming from China and won’t arrive until May! But hey! I can wait. I placed the order and then realised that they might be clip on or elasticated! I contacted seller who seemed very sweet but there was a language problem Chinese v English. A short search later I found a private seller with one silk tie for sale. Well it was a start! A lovely silk tie in girly colours and great condition. The tie arrived promptly this morning and it is very nice. I then turned it over and Amazingly Naked ladies! Tasteful but naked. This is an interesting craft project indeed. I am busy preparing for our Village Christmas Fair. 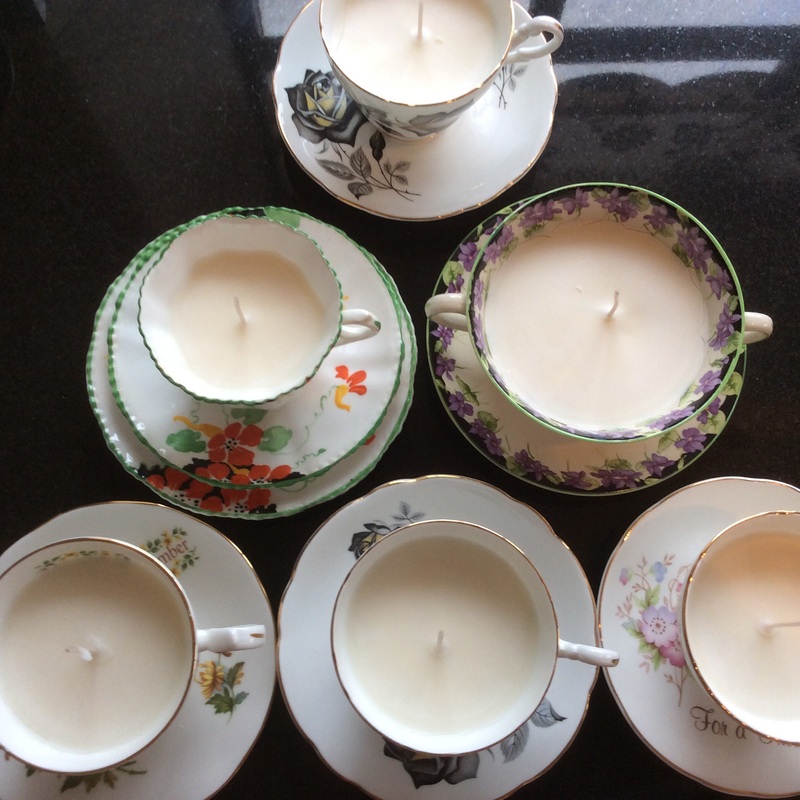 I have been pouring candles into vintage China cups to sell. They make great Christmas gifts and usually sell well. I do have plans for other crafty gifts but as ever time is critical, so we will see. 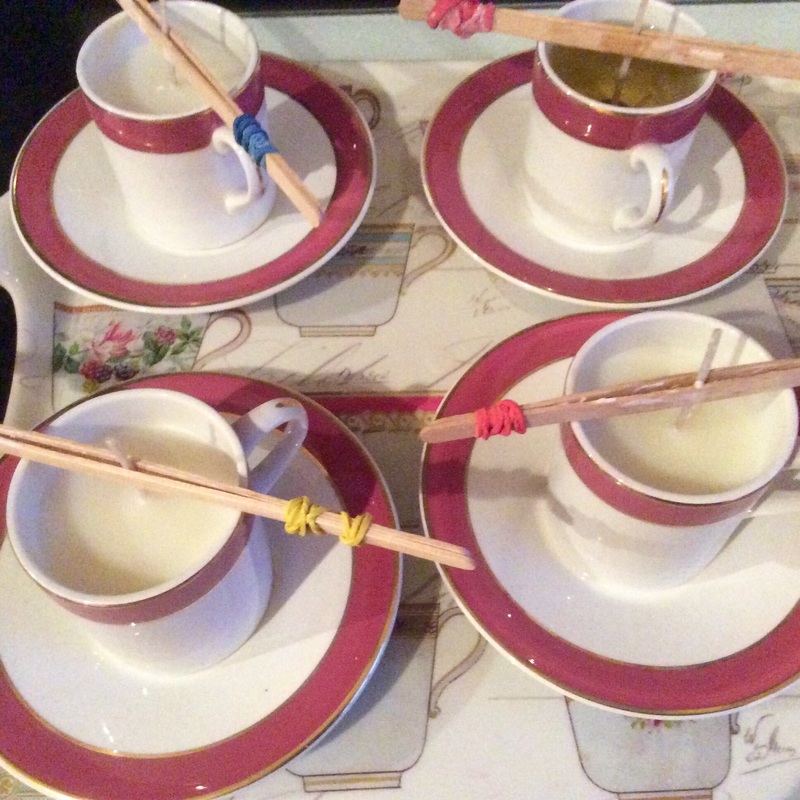 For my candles I use Soy Wax which is much better than paraffin wax. Soy wax burns slowly with a clear flame and no soot. And, importantly they are eco friendly! Today I have made ten candles in cups. They are gently perfumed with lavender. I will, hopefully make another ten later in the week. Maybe, just maybe, I will find time for the other project. But I will let you know! 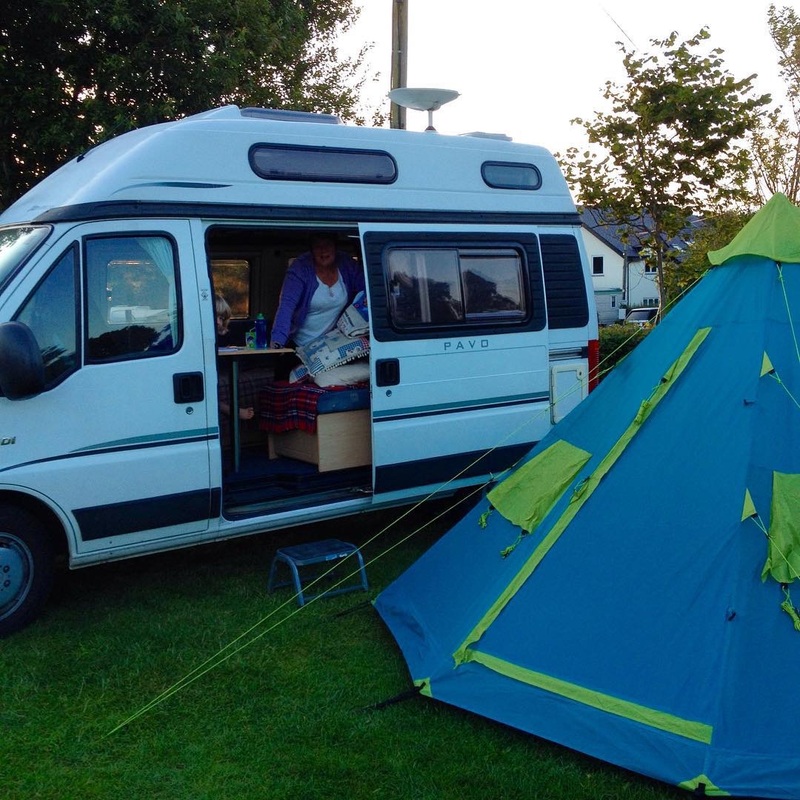 Now I know that I said we had put Damnvan away for the winter but the weather was such a good forecast! 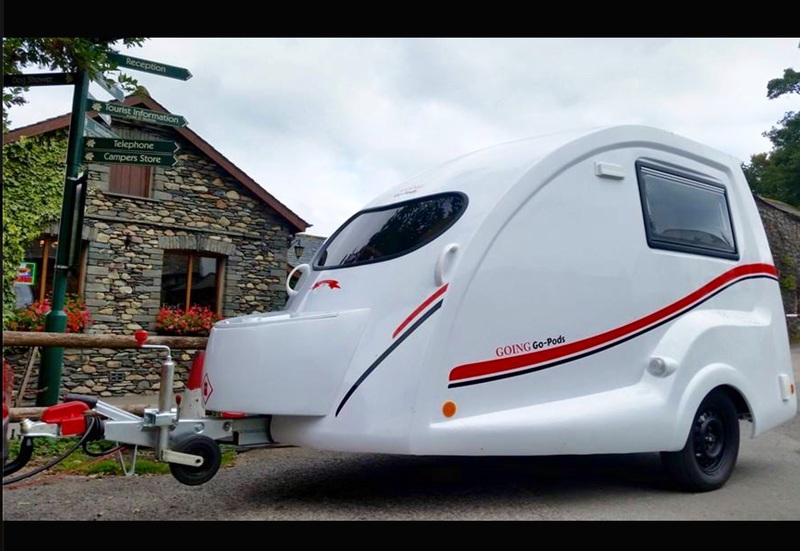 The Lake District beckoned! We had a window of opportunity! We needed to get away!! So we took Damnvan out of her early hibernation and drove into the sunset. Well, not exactly but you get the gist. 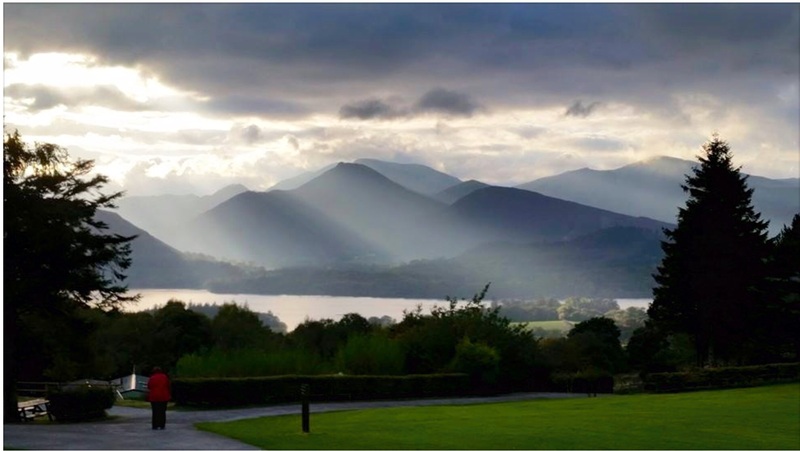 This is the view of Derwentwater from our van last evening, making life worthwhile. Staying close to us is this delightful van. I want one of these! Sensible son suggested that we just sell up, buy a “Bad Boy” and travel the World. Now that’s a thought for the day……..
As mentioned in my earlier blog I recently celebrated a Vintage birthday( Don’t ask!) with a Vintage Tea Party. Here are a few more pictures to show you the beautiful embroidered linens and a small selection of the Vintage China that we have available for hire. This is from Nanna Amy’s Vintage Tea Party. We have beautiful China and lovely lace cloths. 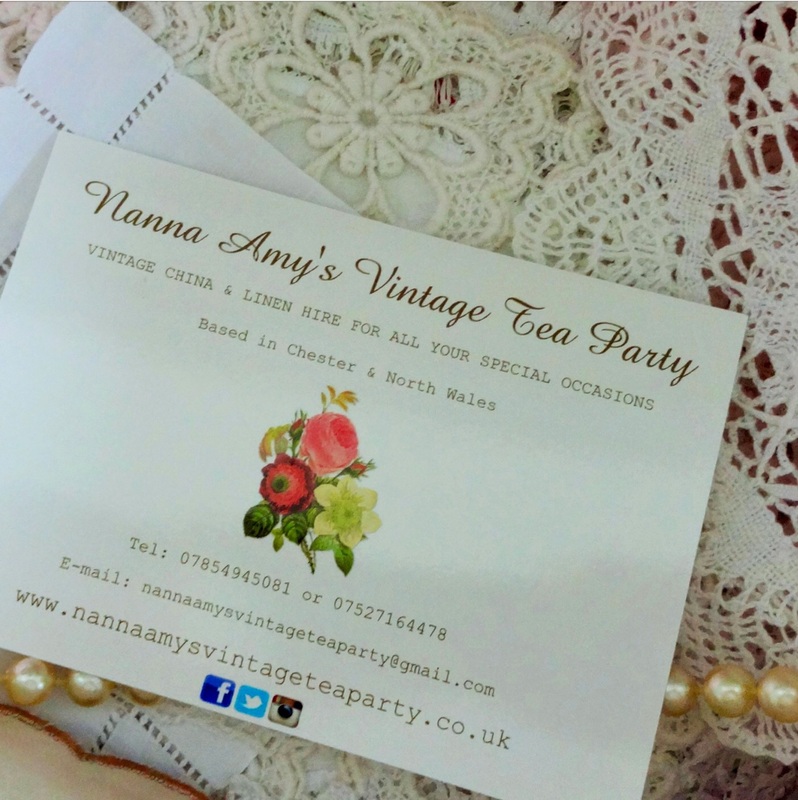 Nanna Amy’s Vintage Tea Party offers a bespoke vintage service tailored to your requirements. You can hire all the vintage table settings that you need for your special event. I have spent hours washing and starching lace doilies. I reckon that I’m the only person who uses starch these days. You do get a lovely stiff finish however. 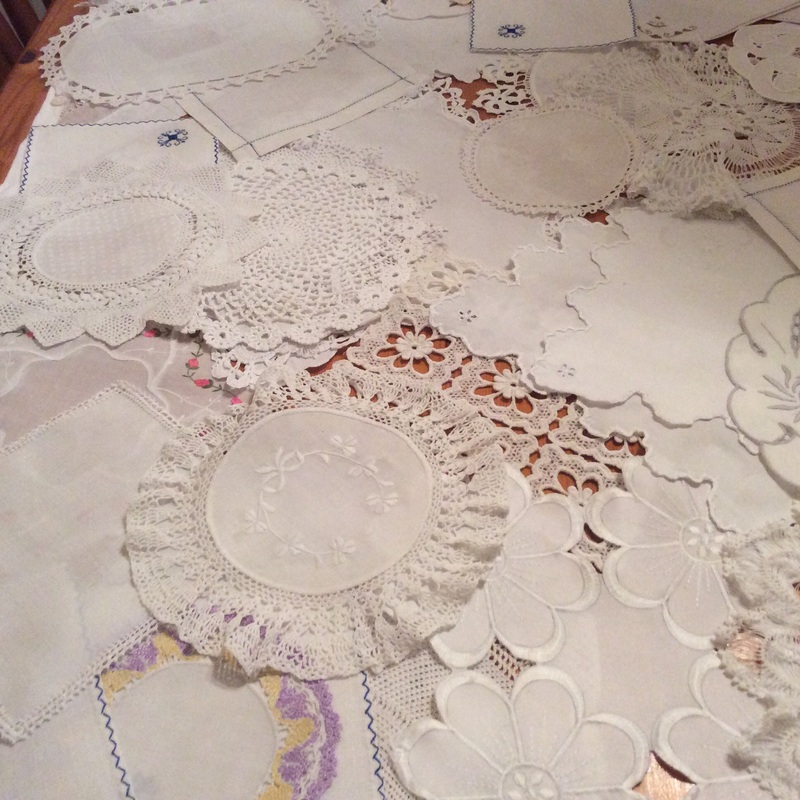 At the last count I had ironed 47 doilies and 6 table cloths! This is for our new venture “Nanna Amy’s Vintage Tea Party” whose launch party gets ever closer! 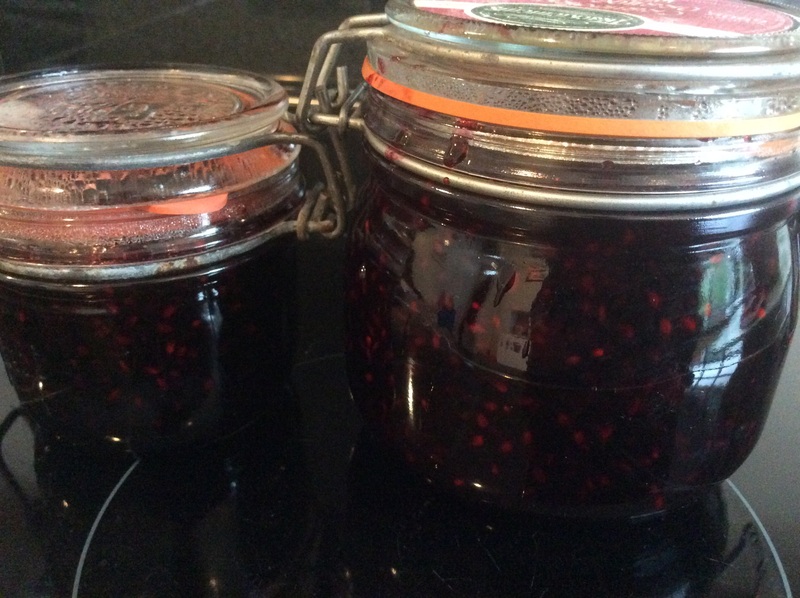 With the party in mind I have made Blackberry jam. Imagine freshly baked scones, clotted cream and Blackberry jam. Heaven on a plate! All served on vintage place settings. 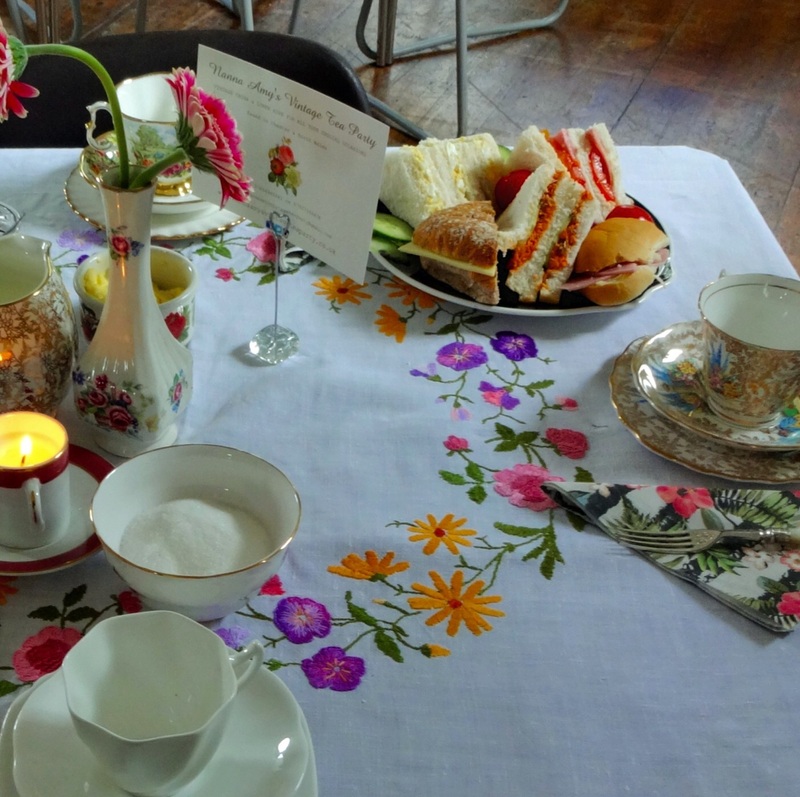 Nanna Amys Vintage Tea Party is a hire service for very vintage China and freshly laundered (and starched) table linen. 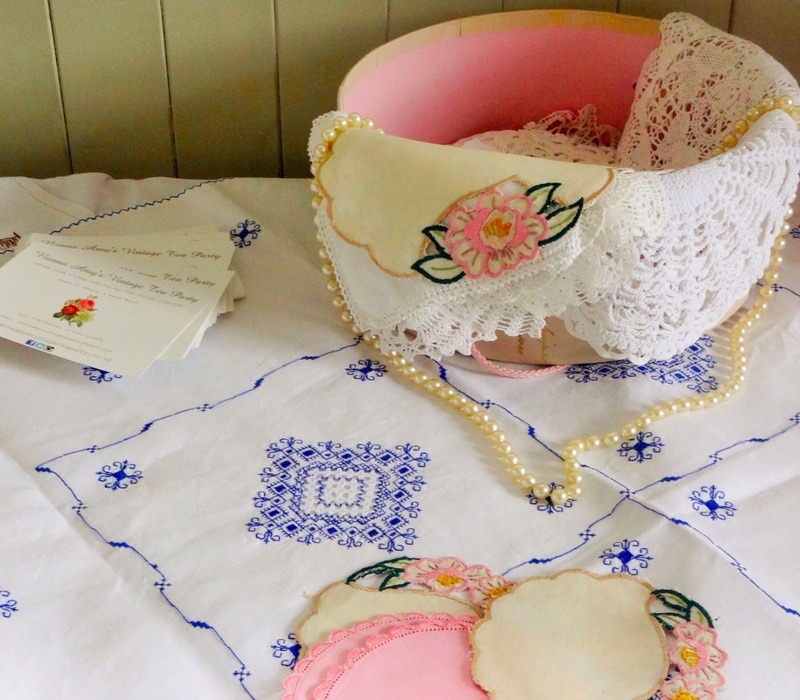 We’ve got lace, embroidery and crochet cloths to compliment beautiful mix and match vintage tea sets. It’s great fun. Perfect for a very special very vintage party. 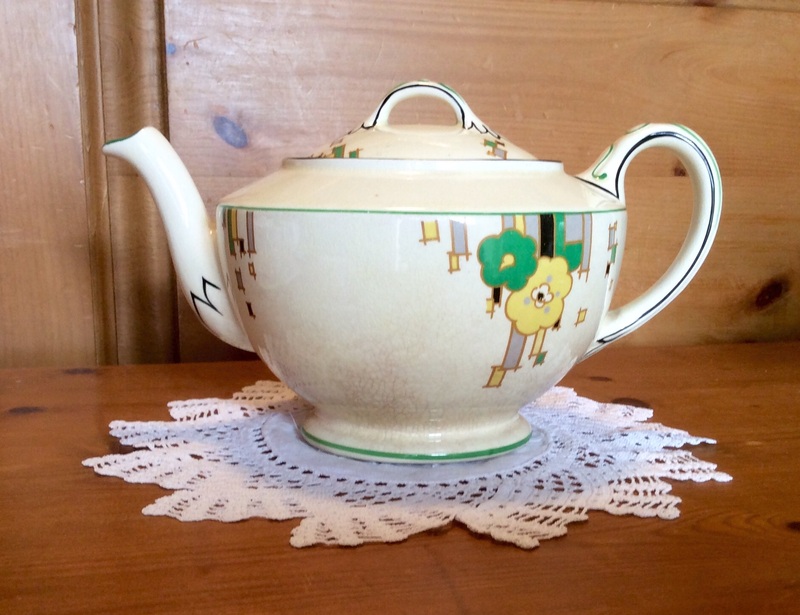 Go to nannaamysvintageteaparty on Facebook, Instagram or web page. More candles! I’ve made a large batch of candles in tea and coffee cups for the launch event of Nanna Amy’s Vintage Tea Party. I use Soy wax, no paraffin, vintage China tea and coffee cups and a Baby Lavender perfume. Soy wax is great as it provides a slow, clean burn leaving no residue. I keep saying that I won’t make anymore then someone asks me or I have spare cups or I need to use the last bit of wax. Actually it is a simple and relaxing craft to do. The really good news is that apart from our launch party, we have two further bookings for our Vintage China and linen hire business. Hopefully it will work out well and if not we’ve had fun. I’ve bought yet more bits and pieces but the main cost is now spent. The hardest set up is done so go Nanna Amy go! I have been sooooo busy sorting,washing and cataloging all the vintage China that I have in my tiny cottage in preparation for the launch of Nanna Amy’s Tea Party next week. Darling Daughter and I are starting work on the marketing and networking for our fledgling lovely business next week. So there will be loads more to tell you! 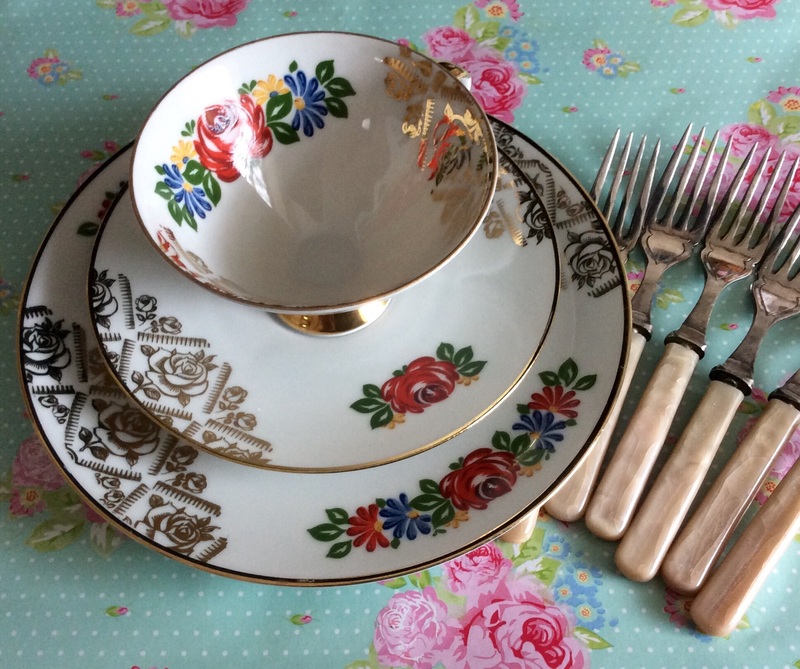 Nanna Amy’s Tea Party is a hire business for very vintage China, freshly laundered linen and all things Vintage Party Plan. WATCH THIS SPACE. Darling Daughter has been working hard on the internet side of the project. We are about to launch the web site, Facebook page, Instagram and Twitter, all of which I need lessons on. It’s great fun and exciting. The business is named after my Grandmother who was a beautiful needle woman and I have inherited her embroidered table cloths and lace doilies. Nanna Amy died many years ago but is fondly remembered by my eldest children. I had a bemused phone call from elder son yesterday as he had received a Twitter message from Nanna Amy?!! I had not told him about the business details and he was bemused how he could receive a message from “beyond”. I have mentioned Our latest venture a few times but now we are about to go more public. We have a marketing strategy, launch date and our first real booking. 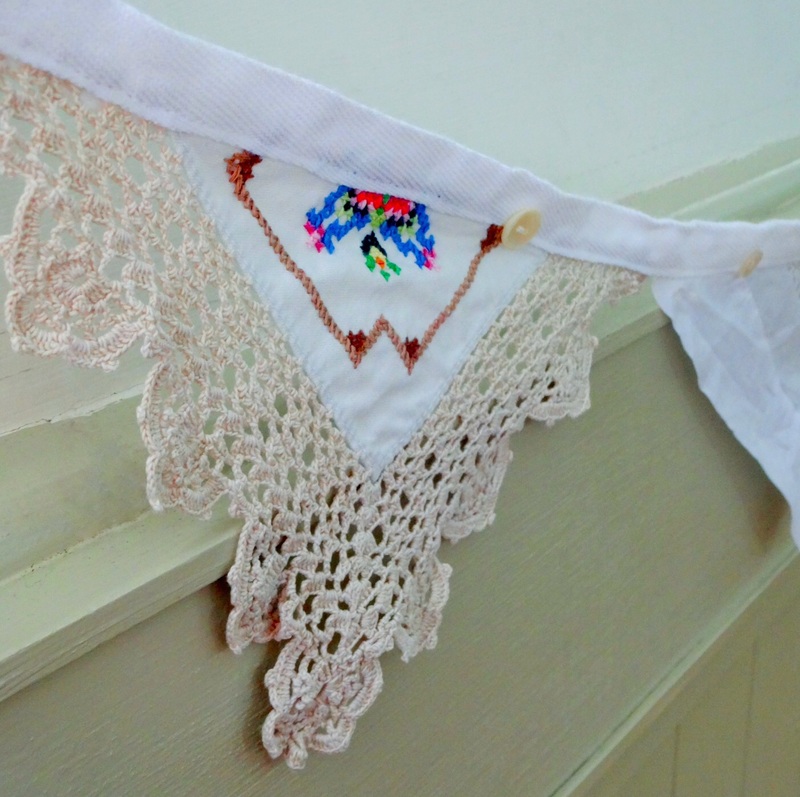 We have collected China, starched linen and made vintage bunting. 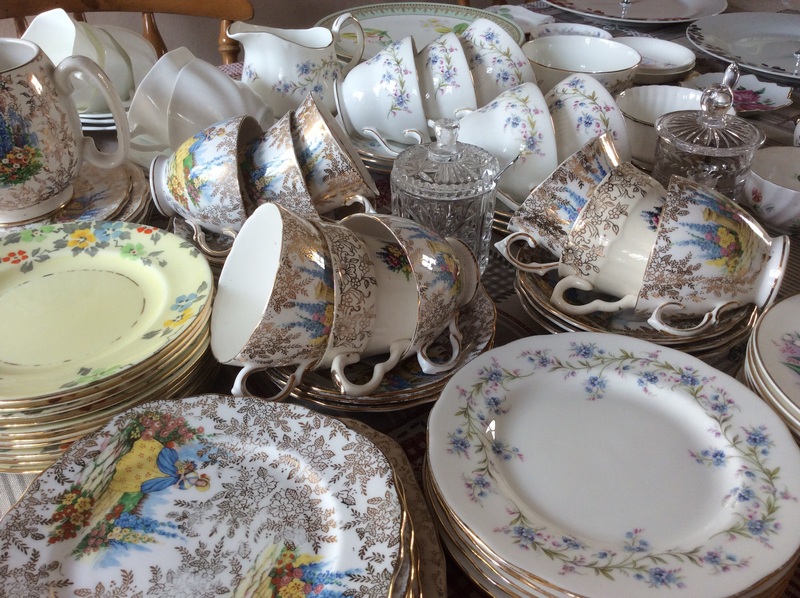 We need to solve transport of precious vintage China, delivery prices and advertising stationery. Most of all IT IS GOOD FUN! Our new venture is named “Nanna Amy’s Vintage Tea Party” and is the hire of beautiful vintage China and freshly laundered vintage linen and lace. We also have items for staging the party or event. We will deliver set up and collect after the event and all things are very Vintage. Watch this space for further information! These items were acquired today and almost complete the initial purchasing of China for our start up. What is it with all these Crinoline Ladies on my vintage linens? 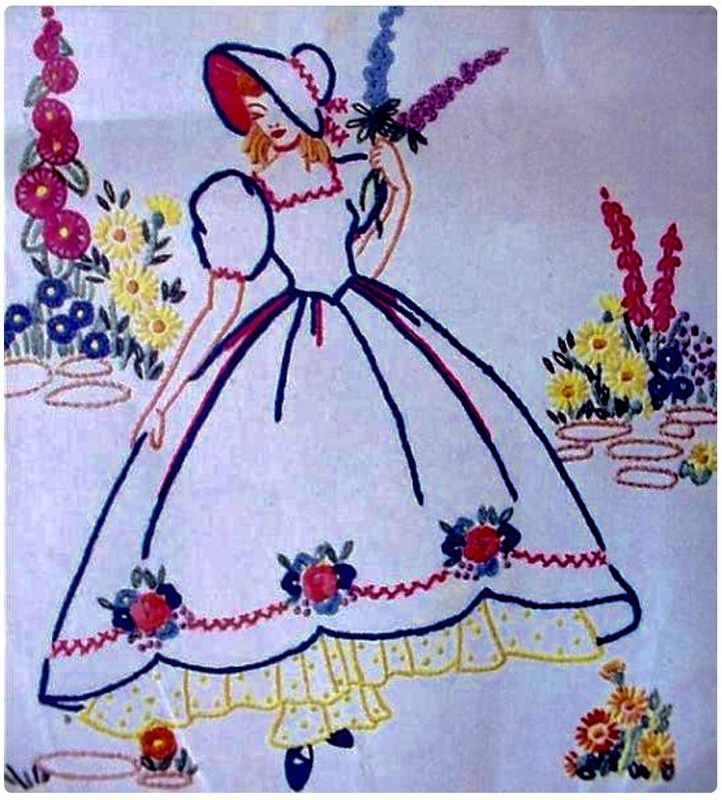 They were very popular in the 30s and 40s embroidery. They are often pictured under romantic flower bowers or carrying a parasol. Our American friends call them Sun Bonnet Sue or Southern Belle. My Nanna (Grandmother) who inspired me to embroider, continued into her 80s as a competant stitch woman. In her later years she attended a City and Guilds embroidery class at her local art school. 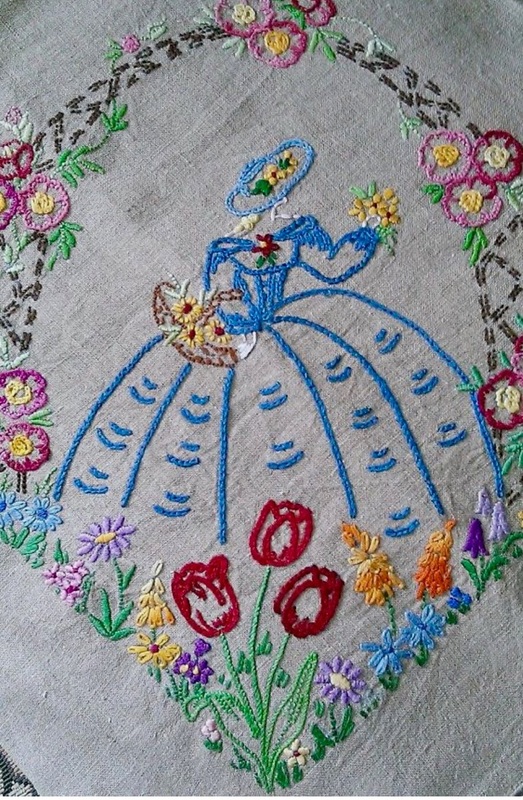 I remember her teacher saying that she was not to embroider anymore Crinoline Ladies as they were old fashioned! What a shame! Nanna didn’t care if she was old fashioned ( which of course she was). All she wanted to do was to embroider Crinoline Ladies! 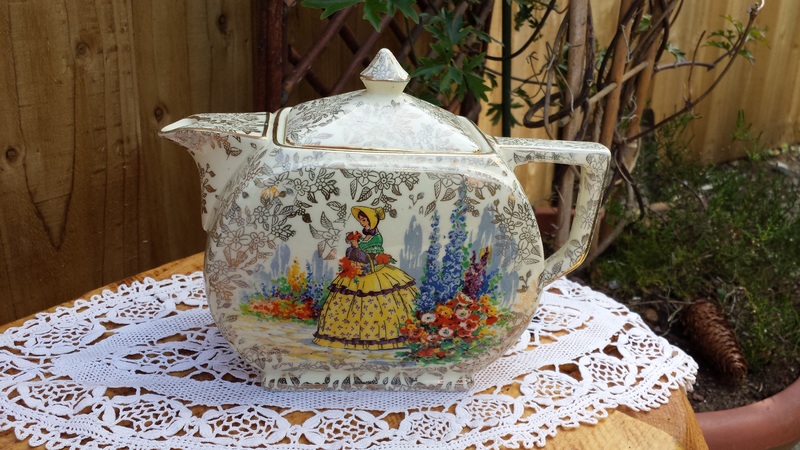 Today I have found a tea pot with a Crinoline Lady on. How cool is that? OK maybe it’s my turn to be old fashioned. I have have been increasing my stash of Vintage China and linens as I am starting a Vintage hire business in the near future. More about that soon.